TOKYO (AP) -- Haruki Murakami’s new novel is set for release in Japan in February -- and that’s about as much as his fans are being told. Publisher Shinchosha Publishing Co. made the announcement Wednesday. The book’s title, theme and exact date of release remain a mystery. Murakami’s longer novels have been released in multiple short volumes in Japanese. A very strange story. 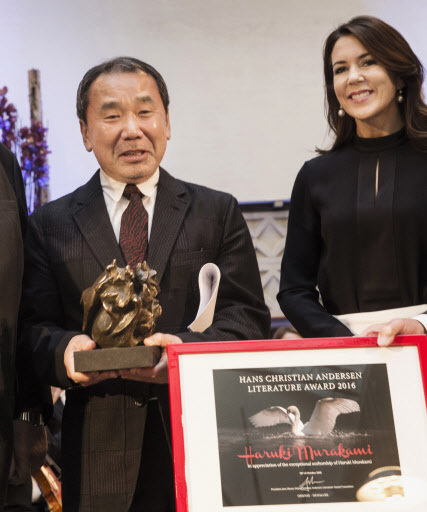 That’s how Murakami himself described the upcoming novel at an event in Denmark, where he recently traveled to receive the Hans Christian Andersen Literature Award. There was no indication of when the new novel might be available outside of Japan. Murakami, 67, usually shies away from the limelight, although he has spoken out on issues such as world peace and nuclear energy. He began writing while running a jazz bar in Tokyo after finishing college. His 1987 romantic novel “Norwegian Wood” was his first best-seller, establishing him as a young literary star. Murakami’s most recent novel is “Colorless Tsukuru Tazaki and His Years of Pilgrimage,” which was released in Japan in 2013. A collection of short stories, “Men Without Women,” was published in 2014. His million-seller “1Q84” in 2009 was one of his longest novels.